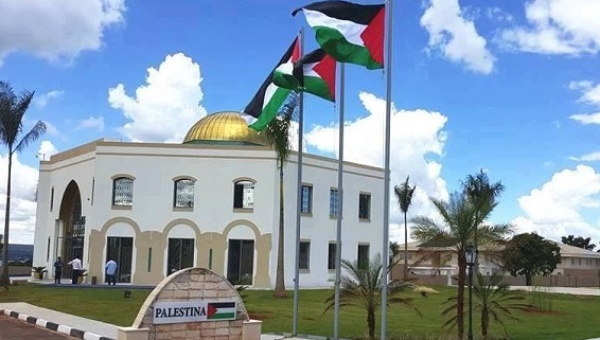 Last Wednesday, Brazil became the first Latin American nation in the Western Hemisphere to have a Palestine Embassy in Brasilia. Palestinian state ambassador Ibrahim Alzeben welcomed ambassadors from several Arab nation-states and leaders of the Arab community in Brazil. In 1979, Islamic Revolutionary government in Tehran gave keys of the abandoned Israeli embassy in Tehran to the visiting PLO chairman Yasser Arafat who came to seek support from the Leader of Islamic Revolution Imam Khomeini. Brazil is home to world’s largest Diaspora community, estimated to be 10 millions. The great majority of them are Christians whose ancestors arrived from Syria and Lebanon in the 1880s at the height of Amazon rubber boom. Islam was introduced to Brazil by Muslim West African slaves brought by the Portuguese Christian colonists in 1500. Interestingly, American Jewish billionaire S. Daniel Abraham’s S. Daniel Abraham Center for Middle East Peace, a Zionist pro-Israel advocacy group, put a full-page advertisement in The Jew York Times (Feb. 4, 2016), urging Jews around the world to campaign for the so-called two-state solution; a nuclear Jewish state and a demilitarized Palestine state. The ad warned that Zionist dream of Eretz Yisrael (Greater Israel) has failed as the demographic Jewish population will become a minority (49%) within the so-called ‘one state Israel’ by 2020, and 44% by 2030. Thanks, Brazil and President Rousseff, for this important step to help Palestinians.